Traumatic aortic dissection is most commonly caused following sudden deceleration injury. It most commonly involves descending thoracic aorta (DTA) and is associated with high mortality and morbidity if not treated urgently. Confirmation of diagnosis often requires contrast-enhanced computed tomography (CECT) or magnetic resonance imaging (MRI), which is time consuming, expensive, and often not available at many health-care facility. Transesophageal echocardiography (TEE) is equally efficient to CECT and MRI in diagnosing aortic dissection. It may also provide additional information that can be very useful for the management of the patient. We report a case of DTA dissection where TEE plays a crucial role during the surgical management of the patient. A 70-year-old male, weighing 62 kg, with no comorbid illness, presented to us with complaints of chest pain and breathlessness following road traffic accidents (RTAs). 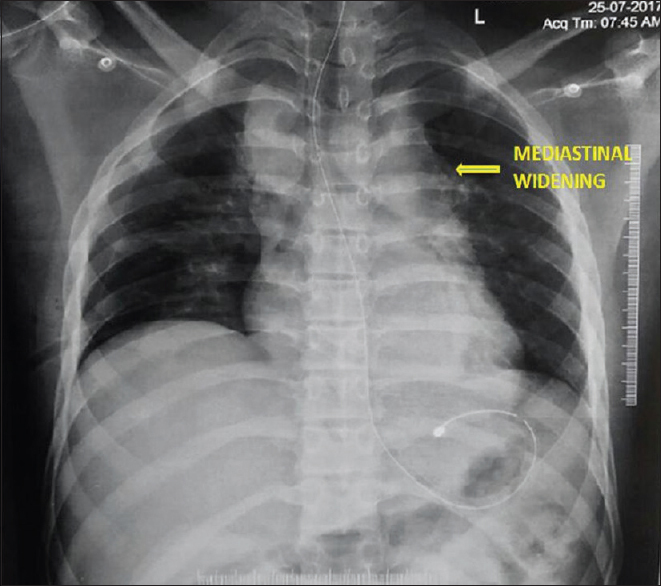 Chest X-ray showed mediastinal widening [Figure 1]. 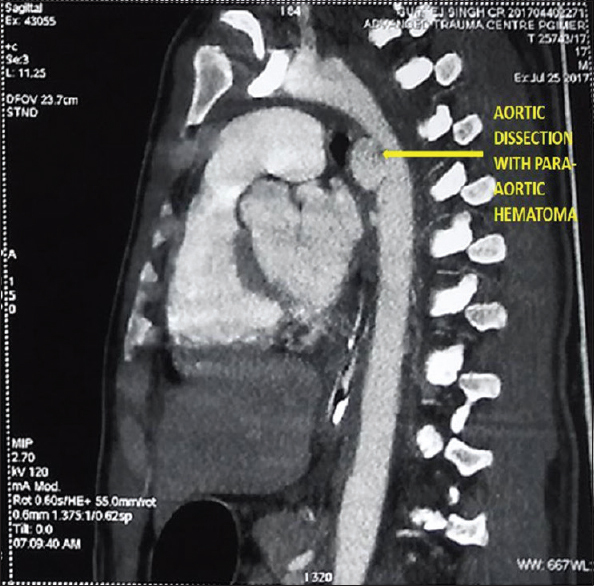 The CECT chest showed dissection of DTA just distal to the left subclavian artery, extending over a length of 4 cm with a para-aortic hematoma [Figure 2]. He was planned for surgical resection of dissection and end-to-end anastomosis of DTA through left posterolateral thoracotomy using left heart bypass. In the operation theater, general anesthesia was induced with balanced anesthesia technique. A 37 F left-sided double-lumen tube was inserted for the isolation of the left lung. TEE examination confirmed the dissection in DTA. Midesophageal descending thoracic aorta long axis view showed a large lacerated flap in the DTA opening into a large (4 cm × 5 cm) pseudoaneurysm cavity. Color flow Doppler showed free flow of blood from the lumen of DTA to the aneurysm. Careful look demonstrated another tear in the wall of DTA few centimeters below the large dissection flap [Figure 3]. Color flow Doppler showed turbulent jet originating from DTA lumen and entering into the same aneurysm cavity. The finding was discussed with the surgeon, and the surgical approach for left heart bypass was modified. Left heart bypass was instituted with cannulation of the left atrium and femoral artery instead of direct cannulation of DTA. A cross-clamp on DTA was applied such that it remains well below the lower margin of the 2nd intimal tear and enough margin of healthy DTA remains available for the anastomosis. Diseased part of DTA was resected, and a Dacron graft was used as a conduit for the anastomosis between proximal and distal end of DTA. After surgery, the patient was shifted to the Intensive Care Unit and extubated after 2 h. The patient had uneventful postoperative course and was discharged from the hospital after 3 days. Traumatic aortic dissection is associated with high morbidity and mortality. The proximal part of DTA is the most common site of dissection following deceleration injury, which occurs due to sudden movement of relatively mobile aortic arch over fixed DTA. Aortic dissection can be suspected from the patient's clinical picture that often includes history of RTA followed by severe chest pain, breathlessness, and mediastinal widening on chest X-ray. CECT chest is most commonly used to confirm the diagnosis as it has high sensitivity (83%–94%) and specificity (87%–100%); however, it is time-consuming, exposes the patient to radiation and radiopaque contrast, and is not readily available. Often, there is a significant time lag between the CECT chest and surgical intervention. Aortic dissection may expand, and even a new dissection can develop over a period of time after blunt trauma due to alteration in hemodynamics that can be potentially be missed in the initial CECT. Although transthoracic echocardiography (TTE) using suprasternal window may be used for the diagnosis of blunt decelerating aortic injuries, it has major limitations of difficulty in getting a good suprasternal notch imaging and the high risk of serious complications in the setting of associated cervical injuries. Furthermore, the diagnosis of traumatic thoracic aortic dissection using TTE is very difficult because of its location. TEE has similar sensitivity (97%–98%) and specificity (76%–100%) in the diagnosis of aortic dissection as of CECT and MRI., Although relatively more invasive and requires anesthesia, it provides advantage of minimum time consumption, assessment of functions, and volume status of the heart and helps in clinching diagnosis of associated cardiac abnormalities in real time. In the index case, TEE examination on two dimensional showed a lacerated flap and an intimal tear in the DTA opening into a large pseudoaneurysm cavity. Careful examination on color flow Doppler showed free flow of blood from the lumen of DTA to the aneurysm originating from two different intimal tears [Figure 3]. Lower intimal tear was located few centimeters below the large dissection flap and was not detected on CECT chest. This led to modification of surgical approach for instituting left heart bypass. Left heart bypass was instituted with cannulation of the left atrium and femoral artery instead of direct cannulation of DTA. The CECT might have failed to detect lower intimal rent possibly because both intimal tears were opening into the same aneurysmal cavity or the lower intimal rent might have developed after the CECT, as there was a gap of about 12 h between CECT chest and TEE examination. Progression of aortic dissections may be missed on CECT chest done in the initial hours after injury. TEE may be very helpful in detection of complication associated with aortic dissection besides confirmation of the diagnosis. DiMaio D, DiMaio VJ. Blunt trauma injuries of the trunk and extremities. In: Forensic Pathology. 2nd ed. Boca Raton: CRC Press; 2001. p. 117-45. Williams JS, Graff JA, Uku JM, Steinig JP. Aortic injury in vehicular trauma. Ann Thorac Surg 1994;57:726-30. Shiga T, Wajima Z, Apfel CC, Inoue T, Ohe Y. Diagnostic accuracy of transesophageal echocardiography, helical computed tomography, and magnetic resonance imaging for suspected thoracic aortic dissection: Systematic review and meta-analysis. Arch Intern Med 2006;166:1350-6. Bowen DA, Teare RD. Delayed traumatic rupture of aorta. Thorax 1962;17:150-3. 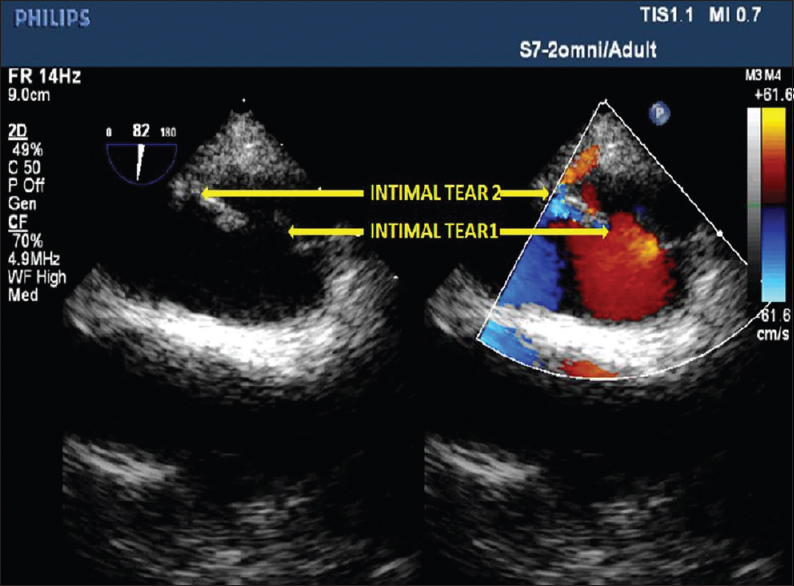 Turhan H, Topaloglu S, Cagli K, Sasmaz H, Kutuk E. Traumatic type B aortic dissection causing near total occlusion of aortic lumen and diagnosed by transthoracic echocardiography: A case report. J Am Soc Echocardiogr 2004;17:80-2. Ballal RS, Nanda NC, Gatewood R, D'Arcy B, Samdarshi TE, Holman WL, et al. Usefulness of transesophageal echocardiography in assessment of aortic dissection. Circulation 1991;84:1903-14.